This is the 4th Annual Car Show at Trinity Lutheran Church and School. As in the past, we expect about 200 cars, trucks and motorcycles, not to mention some special interest vehicles as well. This is an award show. We expect to have quite a variety of hot rods, street rods, muscle cars, sports cars, and trucks, as well as special interest vehicles as well. As in the past several years, this will be an award show with 26 awards plus specialty awards. Since it is Armed Forces Day, this year we will also have a special award for the Best Veteran’s vehicle. A fun filled day is planned for all attendees as well as spectators. We will have things for the kiddos to do as well. To start the show, Bend Band of Brothers will honor Armed Forces Day with the Flag Line, and our school choir will sing the National Anthem. This will be done in conjunction to Armed Forces Day. We encourage all attendees to decorate their vehicles with American Flags if they wish. There will be Silent Auctions going on all day as well as raffles. Remember, 100% of the entry fees, proceeds from the raffles and Silent Auctions items will go to Trinity Lutheran School for Tuition Assistance. Lots of good food for sale. We will have smoked beef, freshly cooked on site, hamburgers, hotdogs, and drinks will also be available for sale. So please bring your appetites and plan to have a great time at the show. Please come and join the fun on May 18, 2019, from 10:00 a.m. until 3:00 p.m. There will be so much to see. If you have any questions, please call either Kari Rooney at 541-382-1832 or Wendy Meagher at 541-647-1769. 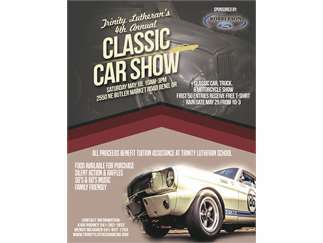 As in the past, there is no fee for spectators, only those who wish to show their cars at this wonderful fundraising event for Trinity Lutheran School. Cost: $20.00 to pre-register a vehicle before May 11, 2019, $25.00 registration fee May 12 - 18 If mailing registration forms in, they must be postmarked on or before May 11, 2019, for the pre-registration fee.